A 2014 Olivier Award-winning comedy Jeeves and Wooster in Perfect Nonsense is playing at Hartford Stage through Saturday, April 20. British director Sean Foley has staged this romp, written by brothers David and Robert Goodale, for its North American premiere in Connecticut. 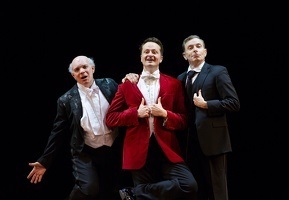 Three Broadway equity actors – Chandler Williams (Bertie Wooster), Arnie Burton (Jeeves) and Eddie Korbich (Seppings) fill the stage with a plethora of characters: a batty old aunt, a very tall dictator, a couple of silly marriageable-age girls, a fat policeman, a near-sighted suitor, a shopkeeper, a condescending Scottish servant and an unpleasant bombastic aristocrat. Each of these professionals shine in their roles, with Mr. Korbich standing out as the maddest hatter of all. For those who know the wonderful 1990-1993 TV series “Jeeves and Wooster,” starring Hugh Laurie and Stephen Fry, the convoluted plot of this staged version, constructed from a multitude of P.G.Wodehouse stories, should be easy to understand. For those unfamiliar with British humor and accents, a difficulty may ensue in attempting to make sense of the story. To “catch” the rapid-fire dialogue spoken by characters who have been written to speak with upper-class speech impediments or high-register screechy voices, some in the audience might feel lost. An actor might say (to paraphrase) “We are going out to see Sir Derrick Crumplesplinters up at Dingleswitch Hall in Rumpledoody Village on the Thursday,” but it comes out sounding like “Phump, Phump, Phumpity Phump, Phumpy Phoo.” A bit of tweaking the sound system during this run and a directorial adjustment in the way the cadence and words are spoken, might help the actors to get the unfamiliar words, proper names and phrases more clearly understood by American audiences. John Gromada’s sound design works better for the original music and sprightly sound effects. Never mind. The English music-hall inspired madness, coupled with Wodehouse’s skewering of the Edwardian idle upper classes, gives this comedy unbridled energy and many hilarious sight gags. Pulling all the stops, Alice Power has designed “portable” scenery that is so clever that it often elicits applause. Philip Rosenberg’s imaginative lighting design, especially the roller-coaster action and the strobe lighting in the “cow creamer” scene, is spot on. The clever stagecraft makes the most of slapstick comedy – with doors and windows rapidly opening and closing adding to the mayhem - and quick-change scenes are cleverly costumed by the same aforenamed Alice Power. Adam Cates choreographs the wild action, pratfalls, spins and turns to perfection. Lori Lundquist as Production Stage Manager makes certain that a motor car, an umbrella, bicycle, ladder, sherry glasses and parlor chairs are all in their proper places – not an easy task with all the energetic comings and goings of the dim-witted Wooster, the long-suffering but loyal Jeeves, the tottering Seppings, and the assorted and sundry nitwits who we meet along the way. Jeeves & Wooster in “Perfect Nonsense” is imperfect but zany fun. Had the director adjusted the comedy to play for an American audience, the play would have been a five-star hit. But three and a half out of five guffaws isn’t half bad for a mindless silly afternoon or evening in the theater. Playing Tue., Wed., Thur., Sun. at 7:30 p.m.—Fri., Sat. at 8 p.m.—Sat., Sun. at 2 p.m.